Barricade: Type of entrenchment that is usually made with barrels filled with earth for the purpose of defending oneself or finding cover from the enemy. In the early morning hours of June 5, 1832, crowds of workers, students, militants, and a scattering of political refugees began to gather in the streets of Paris.1 The intent of most participants was to express displeasure with the Orléanist July monarchy, which had been installed just two years earlier, though the occasion for their protest was provided by the death of General Jean Maximilien Lamarque. Once a stalwart of the First Empire, this military hero had undergone a political rebirth as an opposition leader in the Chamber of Deputies during the last years of the Bourbon Restoration and the first years of the July Monarchy. Parisians critical of the new government sought to honor this service by accompanying the general's mortal remains on a last tour of their city before the hearse departed for Lamarque's native province in the southwest of France. In the spring of 1832, France was struck by a deadly cholera epidemic, which compounded an economic crisis so severe that it had precipitated the previous fall's insurrection by Lyon silk workers. This combination raised the level of tensions within the Parisian working class to fever pitch. By June 2, when the popular Lamarque was struck down by the disease, fear and resentment over the threats to the population's physical and economic well-being had reached a critical stage. They built upon simmering political discontents, especially strong among republicans, who felt that they had spilled their blood on the 1830 barricades only to have their revolution "stolen" by a coterie of opportunists, who managed to get Louis-Philippe crowned king. Leftists were struggling to form their own alliance of convenience. Their partners included both Bonapartists, who claimed Lamarque as one of their own, and Legitimists, who were willing to lend their financial and logistical support to any initiative that, by overthrowing the upstart junior branch of the House of Bourbon, might rekindle hope for the restoration of the senior line of descent.3 This convergence of political forces explains why the cortège that accompanied Lamarque's casket attracted a crowd numbering in the tens of thousands. The tense standoff between protesters and a corps of dragoons, under strict orders to refrain from the use of deadly force, was suddenly ended when a shot rang out from an unknown quarter.6 Members of the crowd began throwing stones at soldiers and municipal guardsmen and, for the first time that day, the time-honored cry "To the barricades!" echoed through the streets of Paris.7 The sound of the tocsin-the rapid ringing of church bells that served as both an alarm and a call to arms-soon pervaded the city, drowning out all casual conversation. Insurgents began uprooting the saplings planted to replace the larger trees cut down during the July Days. They also scavenged planks and beams from nearby construction sites and improvised tools for prying up paving stones.8 These classic raw materials were natural choices because they added mass, helped knit the structure together, and were usually found in abundance right at the site of barricade construction. Between 5 P.M., when the first sporadic gunfire was exchanged, and 6:30, when pitched battles were initially reported, dozens of barricades had been completed on both the right and left banks of the Seine. Individual structures took as little as fifteen minutes to erect. By early evening, the first deadly clash broke out near the porte Saint-Denis, where a number of barricades had been erected. It soon spread to traditional sites of resistance in the quartier Saint-Martin and further east in the faubourg Saint-Antoine. The affected area included the rues Aubry-le-boucher, Beaubourg, and Transnonain and the entire neighborhood surrounding the Eglise Saint-Merri-territory that would also lie at the heart of another celebrated insurrection in April 1834. By the morning of June 6, the last pockets of resistance on the left bank had already been contained and the insurrection confined to the three right-bank neighborhoods marked as centers of combat on map 1. Counting all units of the National and Municipal Guards in addition to the larger complement of soldiers from the regular army, the forces at the government's disposal now approached 60,000 men. Given the lack of popular response to the insurgents' appeals, the outcome could no longer be in doubt. At noon on the second day of fighting, the king again reviewed the troops on the place de la Concorde before setting out on an intrepid (and still quite perilous) horseback tour that took him across the city to the place de la Bastille via the grands boulevards and back again through the faubourg Saint-Antoine and along the quays. What Is an Insurgent Barricade? Though it culminated in a spectacular armed confrontation, the 1832 revolt was in many respects unremarkable. Gauged in terms of numbers of participants, it was of no more than average size. It never seriously imperiled the regime in power and had no lasting political impact. Indeed, it would doubtless have been dismissed as just one more unsuccessful nineteenth-century insurrection had Victor Hugo not chosen it as the setting for the climactic scene of his epic novel, Les misérables.16 Like that other classic of the literature on barricades, Gustave Flaubert's Sentimental Education, Hugo's actually dates from the 1860s and illustrates the heights to which insurrectionary consciousness had vaulted by the second half of the nineteenth century, when, for Europeans, the very word "barricade" had become all but synonymous with the concept of revolution. Though barricades had by then been an established element in Parisian insurrections for nearly two and a half centuries, the uprising of June 5-6 has inevitably been measured against the standard set by the successful revolutions of 1830 and 1848. However different in scale and outcome, the disturbances associated with General Lamarque's funeral shared with these far more consequential events a number of remarkable similarities, starting with the patchwork of Parisian neighborhoods most affected and extending even to the physical location of individual barricades. The 1832 uprising makes a useful backdrop against which to explore the question of what should count as a barricade. The challenge lies in arriving at a definition that can be applied regardless of the size, objectives, social base, outcome, or other characteristics of the event in question, but that nonetheless delimits a coherent and recognizable category, the contents of which can be understood in common terms. If one were to take at face value the 1694 definition offered by the Académie française in the epigraph to this chapter, the essence of the barricade consisted in either the materials from which it was fashioned or the purpose it fulfilled. Yet, with the benefit of over 300 additional years of experience, we can see that neither of those considerations is determinative. Though specific components like barrels played a noteworthy role in the origin of the barricade, an incredible diversity of raw materials has been used in their construction over the centuries without ever rendering the resulting structure any less identifiably a barricade. And though the first barricades were built for protection, they have since shown that they are capable of performing a remarkable range of functions. Some of their most important uses defy straightforward classification as defensive or offensive and may in fact have little to do with military or practical objectives at all. What is truly remarkable about the barricade is, not its physical form in any particular era, but rather the fact that, despite all its varied manifestations, it has retained its identity, making it possible to speak of the barricade as having a history of its own. The barricades of 1648, the barricades of 1795, and the barricades of 1832 shared common characteristics that allowed observers and participants alike to see them all as part of a single insurrectionary lineage. Allowing for differences in weaponry, ideology, and political context, the same sort of underlying continuity linked those who participated in the June Days of 1848 to the partisans of the Holy League in 1588. Such continuity seems all the more noteworthy given the absence of preexisting organization that typified most barricade events. Participants came together more or less spontaneously, sometimes without ever having met those who fought shoulder-to-shoulder alongside them. At best, their experience might have been acquired in some earlier insurrection, which was likely to be just as lacking in coordination or planning. Yet when the call came to man the barricades, they knew just what to do, and managed to concert their actions with great efficiency, even without benefit of the most rudimentary of command structures. This uncanny convergence in the behavior of individuals thrown together by their common desire to protest presents us with a mystery that the study of the barricade can help explain by unraveling the logic that inheres in even the most unstructured and chaotic instances of civic rebellion. Barrels were, in fact, a ubiquitous element in urban commerce and daily life in the sixteenth century, and they continued to play a conspicuous role in barricade construction throughout the period covered by this study (as many of the illustrations accompanying later chapters will confirm). Their great advantage was that, when empty, they could be rolled into place with little effort. Once stood on end and filled with earth, gravel, mud, or manure, they instantly became solid barriers. Of course, to be truly effective, a barricade had to accumulate a certain bulk. For this, insurgents had recourse to that other great staple of barricade construction, the pavé. Quarried paving stones were often used to fill barrels or to wall in an upended cart, but mostly they were just piled up in a dense, disorderly heap. Cobblestones were an ideal material, because they were available in unlimited quantity as the pavement beneath the insurgents' feet (figs. 1, 2, and 3 above). They could be transported individually without great difficulty yet, once loosely tied together-for example, with balustrades torn from stairways and balconies or wrought-iron gates pilfered from a neighborhood park-they became an almost immovable mass. Paving stones were so consistently employed for the purpose that the French term pavé became a common synonym for the barricade. Additional materials used to build upon this solid foundation might come from anywhere. Houses in the process of construction or repair supplied beams, planks, and posts. A metal banister and enormous flagstones from a stairway landing were used in one 1851 barricade. In the 1839 insurrection, centered in a part of Paris bordering the market district known as les Halles, insurgents made use of vegetable baskets, egg crates, brooms, and counters from merchants' stalls. During the February Days of 1848, militants must have taken special pleasure in chasing a gendarme from the sentry box where he was stationed, before hoisting it on top of the barricade they had begun nearby, expressing in one succinct gesture the shift in who controlled the street. Insurgents' standard practice was to scour the surrounding neighborhood in search of anything that might suit their needs. They were reported to have torn out public urinals, hauled away bales of wool from the display in front of a draper's shop, pulled down lampposts, and removed window shutters from the walls of adjoining buildings. They scavenged street benches, cut down the trees that provided the benches with shade, and returned to lug away the heavy metal grates that had protected the trees' roots.25 Mattresses "liberated" from nearby barracks and hospitals served not just to make the rebels' stony redoubt more comfortable but also to reduce the risk of ricocheting bullets. Home furnishings were offered by sympathetic residents (or simply confiscated if cooperation was withheld). Books, tables, chairs, beds, armoires, and chests of drawers were frequently mentioned, but the list of materials occasionally included more unusual items, such as pianos, bathtubs, a perambulator, commodes, dead horses, and, on one occasion, a blacksmith's anvil. A Barricade by Any Other Name? At the risk of being accused of misguided literalism, I would like to argue that these fortifications of the ancient world, which might seem perfectly analogous to those discussed and illustrated in the preceding section, should nonetheless be excluded from consideration as barricades. The simple reason is that no such concept yet existed, as evidenced by the absence of a consistently applied, dedicated term to express it. Suitable structures may have appeared from time to time, but until there was a category that participants could use to place them, both cognitively and linguistically, they would not have been thought of as a discrete phenomenon, and separate instances or episodes involving their construction would not readily be linked together. Under such circumstances, any notion of a history of the barricade was, in effect, unthinkable, and any effort to include these early artifacts as part of a coherent and self-conscious practice of barricade construction would require that we impose upon their creators' actions an externally derived meaning. Until the sixteenth century, when the term barricade was coined, people described structures of this kind with a vocabulary borrowed from the architects of military fortifications. Thus, the Greeks and Romans would have designated the ancient precursors of the barricade as breastworks or ramparts, by analogy to their equivalents in siege warfare, just as inhabitants of the medieval or early-modern world might have spoken of bulwarks, mantelets, or abattis. An incident that took place in 1425 illustrates the significance of the linguistic distinction I have in mind. England, which stands virtually alone among European nations in never having experienced a barricade event as defined in this study, was in 1425 a country nominally ruled by Henry VI, but in fact divided into warring factions led by the duke of Gloucester and Henry Beaufort, bishop of Winchester.29 When Gloucester was called to the Continent to oversee the invasion of Hainaut in 1425, Beaufort took advantage of his absence from London to concentrate a sizable force of men-at-arms and archers in Southwark, just across the Thames River. Gloucester's return set the stage for a fateful confrontation between the bishop's supporters, assembled at the south end of London Bridge, and angry Londoners, manning the city gates at the bridge's north end, but threatening at any time to pour across the river. Between nine and ten on the morning of October 30, the bishop's men drew chains across the pillars (stulpes) at the south end of London bridge and proceeded to erect a structure that was a barricade in all but name. Contemporary accounts make mention of barrels (pipes) and barriers (hurdices) that would have given the resulting structure the unmistakable contours of a barricade.30 From the shelter of these improvised fortifications, Beaufort's forces launched their attack on Gloucester and his retinue.31 Thus, a century and a half before Parisians are reputed to have "invented" the barricade, Londoners, by stretching chains across a road and taking positions behind barrels and a palisade, were using similar materials in a similar way. Should we therefore draw the conclusion that the first barricades were English in origin? Though such an inference might seem perfectly reasonable, it must ultimately be rejected. Though indistinguishable in physical terms from edifices that would later qualify, the structure as described by contemporary sources represented a "barricade" avant la lettre-before the very term existed. The English of that period had no word that specifically designated such an entity; their language lacked the means of differentiating it as a technique of urban insurrection or of connecting it to like practices employed either before or after that time. Observers managed to describe its component parts (chaynys, pypys, and hurdeyses) and apply to it preexisting terms (e.g., bulwerkes) borrowed from the idioms of warfare. If the English had continued to improvise this type of temporary fortification, and had they come to view it as a standard tactic worthy of note, they might have been expected to devise a new word to describe it or modify the meaning of one already in existence. In reality, though the conflict that gave rise to this hostile confrontation across the London bridge on October 30, 1425, lasted well into the following year, I have found no evidence to indicate that the protagonists made any further use of such structures, introduced a new term to refer to them, or conceived of their having a history of their own. They exhibited, in short, no barricade consciousness. I have already argued that impromptu barricades built on the fly by civilian insurgents need to be distinguished from planned structures methodically erected by trained troops, corps of sappers and military engineers, or government commissions. But barricade construction is also different from the unthinking impulse that anyone might have when confronted by a mortal threat, to take shelter behind whatever protective cover happens to be available. Building a barricade implies collaboration in a witting act whose shared meaning is most clearly and straightforwardly conveyed by use of that particular label to designate it. Tracing the etymology and early usage of that term will prove helpful in later chapters in establishing the origin and pattern of dissemination of the barricade itself. At present, I only hope to show that we are dealing with a unitary practice by pointing to the common origins of the words used in the European languages spoken in each city where at least one barricade event had occurred by the end of the nineteenth century. In every case, the local expression was either identical to the French original (for example, barricade in English and Flemish) or some close approximation (Barrikade in German, barricata in Italian, barricada in Spanish, barikáda in Czech, baricadă in Romanian, barikád in Hungarian, and barykada in Polish).32 The evidence suggests that the object, like the words used to signify it, was a product of diffusion rather than independent invention, and we need to consider the likelihood that this consistency in language is indicative of still more deeply rooted patterns of recurrence. The concept of the "repertoire of collective action" was introduced into historical discourse by Charles Tilly in the 1970s.33 At its core lies the observation that any given population tends to choose from a fairly limited and well-established set of alternative methods for organizing its protest activities.34 Rather than invent techniques de novo, groups typically revert to one of a handful of familiar options, even when those might be less than ideally suited to achieving the desired outcome.35 For example, in the present-day American context, the demonstration and the sit-in are widely recognized techniques of contention. University students who wish to protest some institutional policy are likely to adopt these or similarly recognizable tactics as a way of making their point (even if a novel approach could be shown to hold promise of an improved likelihood of success). Regardless of size or level of sophistication, groups seeking to lodge claims or effect change in this society are inclined to favor familiar techniques of protest-for example, those previously employed by the Civil Rights, anti-war, feminist, environmental, and other highly visible movements known to participants. Tilly's extrapolation from the characteristics of theatrical repertoires formalized an insight that came naturally to observers of revolutionary upheaval in nineteenth-century France. Pierre-Joseph Proudhon was among those who interpreted the February Days in this light: "Carried away by the intoxication of our historical novels, we took part in a rehearsal based on August 10 [1792,] and July 29 . Without being aware of it, we all became the characters in a play. "38 Almost identical observations were penned by Alexis de Tocqueville and Heinrich Heine, both present at the overthrow of the Orléanist monarchy.39 The simple truth that all of these authors were trying to convey concerned the remarkable continuities or rhythms of return that characterize even the most turbulent historical episodes. Tilly's concept of the repertoire of contention helped refocus attention on this underlying logic of collective action and contributed toward a more systematic and revealing examination of the powerful cultural currents that influence the choices people make even in moments of acute upheaval. Obviously, barricade construction is just one component of such an all-inclusive repertoire. It corresponds to what I have called a "routine"-a sequence of loosely prescribed behaviors that help define the roles and constrain the actions of participants. To sustain the analogy to the theater, we might say that routines-being rooted in concrete situations that impose a unity of time and place-tend to resemble the acts of a classical play. This sort of repertoirial conduct is so striking because the actors appear to be working from a script, even though it is one that has never been written down; and because they are manifestly collaborating in a joint production for which there could never have been a formal rehearsal, not just because the authorities would bring down the curtain with brutal repression but also because most participants have never previously met. The food riot was just such a routine. During the subsistence crises that periodically plagued European societies during the early modern period, an anxious crowd might gather outside a baker's shop, reacting in anger to the news of another jump in the price of bread or to the low quality of the goods on offer. Rather than lash out at random, participants, most of them women, were more likely to follow a set routine that involved seizing control of the establishment, chasing the proprietor from behind the counter, and proceeding to sell the remaining stock to the other customers at what they considered the "just price. "40 Members of the general public were capable of reproducing stock elements of such routines with great fidelity, whether the historical setting was fourteenth-century England or eighteenth-century France.41 Whether the behavior in question involved the tax revolts or shaming ceremonies (charivaris) of the Old Regime-or, in more modern times, the strike, the demonstration, or even the "media event" of the present day-complex sequences of protest activities could be acted out with a bare minimum of formal organization. The construction of barricades, and the constellation of insurrectionary activities that typically accompanied the practice, became an accepted part of French contention. A barricade is an improvised structure, built and defended by civilian insurgents as a means of laying claim to urban space and mobilizing against military or police forces representing the constituted authorities. In the clearest examples, contemporary observers and/or the insurgents themselves will explicitly label such a structure a barricade, though their reversion to recognizable patterns of behavior long associated with barricade construction may also be sufficient to confirm the attribution. By extension, a "barricade event" is any insurrectionary episode that involves the construction, on one or more consecutive days, in a single or adjacent towns, of any number of barricades. “To the barricades!” The cry conjures images of angry citizens, turmoil in the streets, and skirmishes fought behind hastily improvised cover. This definitive history of the barricade charts the origins, development, and diffusion of a uniquely European revolutionary tradition. Mark Traugott traces the barricade from its beginnings in the sixteenth century, to its refinement in the insurrectionary struggles of the long nineteenth century, on through its emergence as an icon of an international culture of revolution. Exploring the most compelling moments of its history, Traugott finds that the barricade is more than a physical structure; it is part of a continuous insurrectionary lineage that features spontaneous collaboration even as it relies on recurrent patterns of self-conscious collective action. 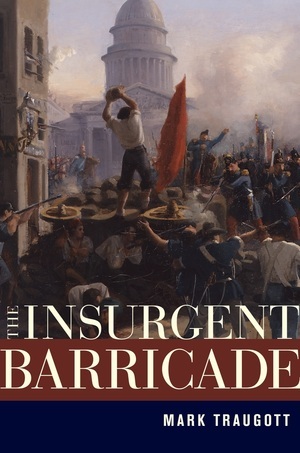 A case study in how techniques of protest originate and evolve, The Insurgent Barricade tells how the French perfected a repertoire of revolution over three centuries, and how students, exiles, and itinerant workers helped it spread across Europe. Mark Traugott is Professor of History and Sociology at the University of California, Santa Cruz. He is the author of Armies of the Poor: Determinants of Working-Class Participation in the Parisian Insurrection of June 1848 and the editor and translator of The French Worker: Autobiographies from the Early Industrial Era (UC Press), among other books. Appendix B. Did the Wave of Revolutionism in 1848 Originate in Paris or Palermo?